Opening with the discovery of a dead sheep, Evie Wyld’s second novel is a sensuous, brutal, disquieting book that will seep under your skin and haunt your dreams. Protagonist Jake Whyte is a strong, mostly self-sufficient sheep farmer making a life for herself on an unnamed British island where the weather is harsh, and the local people nonplussed by this new, unsociable Australian in their midst. But now something is killing her sheep, and memories of the past are tugging at her. In alternate chapters, the stories moves us forward and back, like an insistent tide. The flashbacks move through her past towards childhood, written in a present-tense form that gives them an immediate sense of urgency as we search through her experiences for the ingredients that have made her the frightened, solitary creature she is today, and, most specifically, what caused those terrible scars on her back.The current day chapters are, unexpectedly, relayed in the past tense, and show her fears coalescing as her home is intruded upon – by the weather, by stray animals, by people, and by her imagination. This lyricism carries you through the landscape so that you see feel the chill and dampness as Jake does – a sharp contrast to the arid outback she’s fled from. There’s a subtle humour in Jake too, offering glimpsing of the girl she once was. As she acts out a funeral for a pigeon she has accidentally killed and sends it out to sea, she hums the theme song to Titanic – an act seemingly out of kilter with the ruthless façade she’s developed. In the Australian-based segments, travelling backwards means we leave some scenes before I feel I’ve fully explored them – the sheep station is for me the most intriguing part of the novel and I would have loved to have been a fly on the wall there for a little longer. But once Wyld carries us back a further step, there’s no possibility of slipping forwards again. It’s a book to slide under the covers with in on rainy days, and to give yourself over to, allow to carry you away. Jake’s world will stick to the walls of your mind – and I suggest you let it. 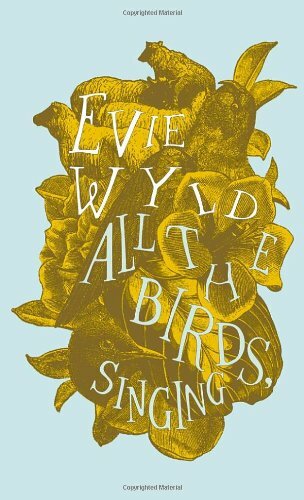 All the Birds, Singing by Evie Wyld* is available to buy from Amazon. *The ‘deleted scenes section of Wyld’s website seem to refer to her earlier novel After The Fire, A Still Small Voice, with no recent enough updates to include All the Birds, Singing. This entry was posted in Reviews and tagged All The Birds Singing, Book reviews, Evie Wyld by Judy. Bookmark the permalink.